What made this recital so special? 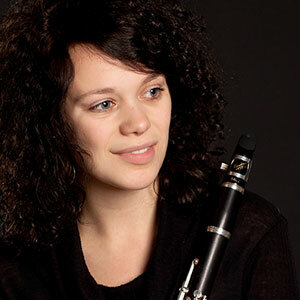 There were a number of reasons – a sense of occasion, being the final group in the 2014 series, the persuasive presence of the highly accomplished young clarinettist, Elaine Ruby and the well-planned and contrasting selection of pieces designed to please all tastes, from the very popular Vocalise by Rachmaninov to the concise, exquisite but challenging Four Pieces Op 5 by Alban Berg, to the dazzling Fantasia on themes from Verdi’s La traviata by Lovreglio, not to mention the opening with Brahms’s E flat Sonata, one of several significant successes of his last years to include the clarinet. From the outset we experienced the full effect of Elaine and Daniel’s instinctive feel for phrasing and widely contrasting highs and lows. A wide spectrum of dynamics was also the hallmark of the duo’s performance throughout and gradations in the use of piano were a speciality. The playing throughout was no less accomplished than we have come to expect from musicians selected by Catherine Hodgson, Concerts in the West Organiser. Indeed, Elaine’s playing had such a degree of involvement, musicality and joy that the audience was captivated from the start. Daniel’s experience was evident, his contribution always vital, often driving and strongly supportive. There was also a degree of novelty in including a rarely performed duo by the composer famed for his Jamaican Rumba, Arthur Benjamin. Written in 1958, two years before the composer’s death, his Tombeau de Ravel proved to be very much alive. As Elaine said, the work has found a very special place in her heart, and there were a number of unexpected turns which the performers relished. We are pleased to report that Concerts in the West’s 2015 season, which will be its tenth anniversary, returns at the end of the first week in February with a piano recital by Martin Cousin, with music by Beethoven, Brahms, Liadov and Rachmaninov.